The Ceausescu clan and their communist useful idiots were quick to remind us of what an enchanted life we lived under his leadership and how terrible life was under evil capitalism and how their people suffered under the boot of the bourgeoisie. We were so protected and full of hope under “mother” Elena and “father” Nicolae’s leadership, we were told ad nauseam, while the opposite reality hit us in the face every day. Commies lied to us in order to cover up their mismanagement of the economy, the disastrous five-year plans, the gross misuse of the land, squandered resources, sold produce and grain to the west for hard currency while people were on rationing cards and hungry, and funds stolen from the treasury or from citizens accused under dubious circumstances of treasonous activities such as enemy of the proletariat. The five-year plans had impossible to achieve goals set by those apparatchiks with high ranking in the Communist Party. People would go to jail for not meeting these goals in the time frame dictated by the Stalinist bureaucrats, illiterate community organizers, who understood nothing about the economy, about industrial or agricultural planning. When things went missing in factories, and they did often, accountants and managers would go to jail as theft occurred under their blind watch. At some point, they ran out of cattle feed and Ceausescu had to distress-slaughter cows. I remember mom saying that beef was tough to chew and purple-looking. To this day, we don’t eat beef. The meat was rationed to 2.5 kg per family per month. Butchers would chop up bones in the meat which turned it into a purplish grey mass thrown on the counter with contempt. We had to bring our own wrapping newspapers and expandable jute shopping bags to carry food home. In addition to this shopping jute bag, people carried extra cash in case a line developed somewhere which meant that they could not pass up the opportunity to buy whatever was on sale. This type of pathological lying to the people is not unlike the Democrats covering up their failed economic policies by telling Americans for eight years now how the economic status quo is our new normal, we should get used to the global economy, to the manufacturing sector moving entirely outside of the U.S., and how our jobs are never coming back. Living under the boot of communism, we could not compare our meager existence with how other people lived because we were forbidden to travel, television programming was tightly controlled, and so were radio broadcasting and the press. Once in a while those in power slipped and broadcast successful mini-series like “Dallas” which gave us a glimpse of the opulent and dreamy life of the Ewings in Texas, the faraway Shangri La where money grew on trees and oil bubbled out of the ground. American movies were smuggled into Romania, translated by a very courageous lady, and sold on the black market when VCRs became available. The dictator Nicolae Ceausescu, a man with no formal education, ordered in 1982 the passage of the “Program of Scientific Nutrition for the Population,” a law that established the rationing of food, how many calories a person could eat, and how much one could weigh. Two years later, the nutritional standards were reduced even more. 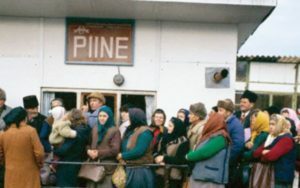 Portions and consumption were controlled through the issuance of cards which could only be used at the local neighborhood grocery store where residents had to register each family member, present proof of identity and residence, and the number of people living in the house, including renters or temporary visitors. Food could only be bought based on the number of people registered. Imagine how mesmerized I was when I first entered the one and only grocery store in a small town in the south, population 3,000, Horn’s Big Star. It was filled with food to the rafters. I was in awe and I kept filling the cart to the brim. My husband was laughing, putting things back and telling me that they will be there tomorrow. I did not believe him at first, I expected empty store shelves on my second trip. I was so incredulous; I went to the grocery store every day to buy nectarines and Red Delicious apples. I was so shocked that I could buy fresh fruit in early January. I just knew that it was all staged for my benefit. Albert, the owner, who was a friend of the family, always greeted me with a big smile which I thought odd. Why is this man always smiling? I was used to sour employees, shouting and treating us like animals, while we pushed and shoved each other in endless lines, often getting to the front of the line and finding out that they ran out of whatever we were waiting to buy. We have an abundance of food and people get irritated in the U.S. when they can’t find their particular brand. Few have any idea that our grocery stores only stock a three-day supply of food. When major storms strike or even the potential of inclement weather in the U.S., shelves of milk, water, and bread disappear really fast at Walmart. 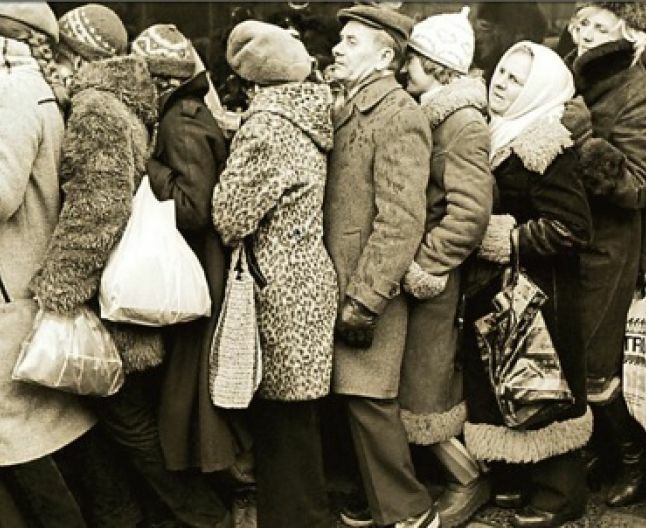 Until you have to stand in endless lines to buy food and basics for survival, such as bread, milk, sugar, oil, flour, butter, or toilet paper and vitamins, until you have to live in the dark and cold when lights, heat, and electricity go out daily, when you have no running water at all or hot water is a rare occurrence, you cannot claim that you are poor, living in an “unjust country.” What you really need is a lesson in history, a trip to Cuba, to some other third world country, and an attitude adjustment to reality. This entry was posted in communism and tagged apparatchiks, bones, Ceausescu, commies, cows, dictatorship, five-year plan, food, ideal weight, lies, lines, rationing, total control by Admin. Bookmark the permalink.